Guy Berger sent me this jaw-dropping photograph of a Business Report poster. I have no idea when it was taken or who took it, but it makes me want to weep — this is, after all, the stuff only seen in a sub-editor’s goriest nightmare. And, more than anything, it makes me fume with fury. But, working with some of the best subs in the country, we did it! And now, of the core launch team, I can think of only one (Jeremy Gordin) who still works for the company. The others have all moved on to greener pastures, including Tony Nicholson (The Sydney Morning Herald), Vernon Matzopolous (Summit TV), Carina Le Grange (Media24), Don Bayley (The Sunday Times) and Les Tilley. 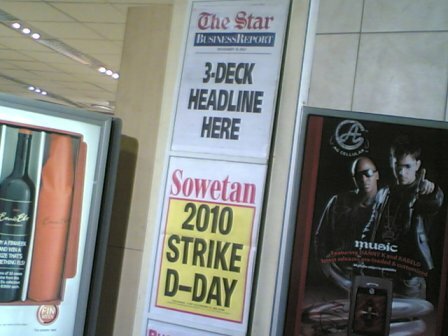 I worked at the Independent at various different titles from 1994 (Pretoria News) until I burnt out at Independent Online in 2000. And only a handful of the many people I worked with remain. Working for an employer that is as ruthless in its pursuit of profit as Independent is neither easy nor pleasant. I will admit that I am bitter. I am bitter because I came to newspapers just in time to glimpse the glory days before economic and commercial pressures snuffed out passion and professionalism. I am bitter because I have seen how once great titles — and, yes, once great journalists, unionists and activists — have been run into the ground and have lost their way. I am bitter because Irish bean counters have stripped the group that holds the nation’s conciousness in its grip as the publisher of 14 major titles. In fact, I am so bitter that I have fantasised that Koni Media will buy Independent instead of Johncom and, perhaps, turn that limping company around. Mr O’Brien, an unhappy 11 percent shareholder in Sir Anthony’s Independent News & Media, said Sir Anthony was too old to run a modern newspaper business, and that by leaving he would save millions of euros. Look, I was working for the company with O’Reilly bought the Argus newspaper company — and its 12 titles — in March 1994, for a few million rand – with the approval of the ANC. [Read this fascinating account of the shifting media landscape in the mid-1990s, which has many of the same elements of current debates around media ownership.] And the fact remains that, in terms of return on investment, the South African operation outperforms any of O’Reilly’s other media investments. Perhaps I am naive, but I always wonder why no one makes a fuss that ownership of the largest newspaper publisher in the country is in foreign hands. All profit from the company goes to Ireland. PS: In 2005, MediaLens wrote an article titled A Special Kind of Independence. I think the author and I share quite a few viewpoints. She (or he) is almost as bitter as I am about Sir Anthony O’Reilly.